Three terrifying tales of post-apocalyptic worlds to keep you up at night . . .
Two years after the zombie apocalypse destroyed the world, Xan lives with his family in one of the few settlements of survivors. Protected by moats and linked by convoys ferrying goods, the settlements are the only safe places to be since zombies will not cross water. Abducted one night, Xan is thrown in the back of a truck and driven out of the settlement. His captors intend to use him as zombie bait to let the convoy pass through. But Xan is determined to get home . . . any way he can. She’s cute. She’s sweet. And she wants to kill. Discovered wandering alone on a Kansas street a year after the zombie apocalypse, a young girl named Holly has been brought to Reclaimed Lincoln, Nebraska, and placed in foster care. Infected with a milder form of the H1Z1 virus, she regresses occasionally into a mindless, violent state that terrifies her foster family. 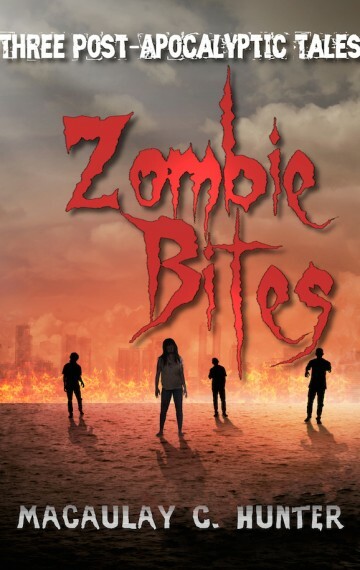 Incredulous that a child could survive a year alone among zombies, seventeen-year-old Corey and his best friend Isaac ditch school to investigate the facts of Holly’s story. But what they find is much more than they bargained for. Money. Fame. Success. Ink Delwich is poised to seize it all. As the manager of the best zombie fighter on the American sports circuit, he is three days away from the Games in which his prized Samson is favored to win. But Ink’s dreams are blown apart when Samson is mysteriously shot in the Delwich Stables. With no fighter to take to the Games, Ink scrambles for a replacement. Thor is nothing impressive at first glance, yet he racks up bloody wins in the ring against zombies owned by rich and dangerous managers. Ink fears that he is about to lose another champion, but malicious eyes are now on Ink himself.